Today I’m contemplating the Daedalus Project – Nick Yee’s psychological study of mmorpgs. 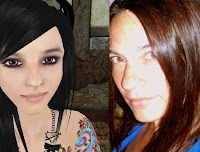 Scholars have found that there is an effect on the real life behavior of people who have avatars, especially those who are considered particularly attractive in-world. “Cyberspace grants us great control over our self-representations. At the click of a button, we can alter our gender, age, attractiveness, and skin tone. But as we choose our avatars online, do our avatars change us in turn? In a series of studies, we've explored how putting people in avatars of different attractiveness or height change how they behave in a virtual environment.” (from the Virtual Human Interactive Lab at Stanford).